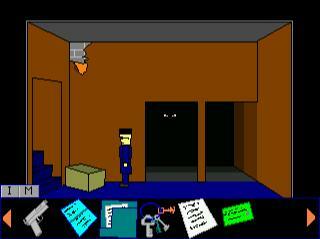 [Entry for September 2003 MAGS] My first finished game ever, hence the quality. You are a policeman, and you go after a missing person. As always, things get ugly. This is my first finished project, hence the quality. I appologize for the typing mistakes, which I have surely made, just not noticed myself. I have added the updated version, which adds one visual/audial shooting scene to the game, in case you worry about the content issue. In the original, found at http://kotisivu.mtv3.fi/tk/McReedCase1.zip this scene is only narrated. The update has also closeup of Scott in the end, option to change the player's talking color, plus other fixes and additions, check readme. There's a cure for that.. raise game speed. It was good, I played it a little bit. The player just walks TOO SLOW.